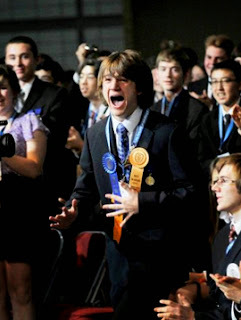 Jack Andraka is not an ordinary teenager by all counts. Sure, he enjoys whitewater kayaking, origami, and a couple of television shows. But he is also a big fan of science and has already made a historic mark in the field of medicine, before he celebrates his 16th birthday in January. What Andraka did is develop a fast, non-intrusive, and inexpensive method to detect an increase of a protein that indicates the presence of pancreatic, ovarian and lung cancer. It's a significant advancement because the earlier cancer can be detected, the greater the chance of survival. He initially came up with the idea during biology class at North County High School. He drew upon a class lesson about antibodies and an article using carbon nanotubes. From this unique combination of data, which he later researched with the help of Google and Wikipedia, it gave him a real start. The miracle early detection test that almost wasn't. Naturally, Andraka isn't the only person to have an epiphany. Many people have ideas across many different fields. Some are even thought up by kids his age. But sadly, most ideas don't go anywhere. Some of them are stopped short for any number of random reasons. For instance, his idea might have drifted away when his biology teacher confiscated his clandestine reading material on carbon nanotubes. Or, even more likely, most students would never be given permission to test their theories. Andraka understands this all too well. His request for laboratory work at Johns Hopkins University and the National Institutes of Health were rejected 199 times before Anirban Maitra, professor of pathology, oncology, and chemical and biomolecular engineering at Johns Hopkins School of Medicine made accommodations. Professor Maitra sees Andraka as a Thomas Edison of our time. Imagine. It is very likely that he was only one rejection away from the support he needed to see his idea through to early detection. But fortunately for him and the rest of the world, Andraka was able to develop a test that costs approximately three cents and requires only five minutes to see results. Developing the test took significantly longer. Andraka dedicated a year and a half of his life outside of school. Most of that time, as he tells it, resulted in nothing more than a ton of failures. But he wouldn't give up. Part of Andraka's inspiration and motivation came from the loss of a close family friend to cancer, someone who he frequently describes as being like an uncle. Like his source for inspiration, most pancreatic cancer patients have less than a 2 percent chance of survival because it's detected to late. The average life expectancy after being diagnosed is three months. The likelihood of surviving five years with pancreatic cancer is less than 5 percent. The reason, according to Andraka, is that the current technique was six years old and costs approximately $800 per test. His solution removes these barriers. It was designed that way from his initial scientific criteria to make the test non-invasive, fast, simple, sensitive, selective, and inexpensive. But before he could begin testing his theories, he had to determine which of some 8,000 proteins in human blood could be used as biomarkers to detect cancer. He researched more than 4,000 proteins before finding one. His breakthrough came about by thinking of a way for an antibody to bind to this specific kind of protein using nanotubes. This was enough to secure lab space for seven months, through trial and error. And that, regardless of any other measure, is what led to his historic breakthrough. Jack Andraka And The ISEF Is A Good Will Pick By Liquid Hip. We chose Jack Andraka in part because of his discovery and in part because he defies the need for expert credentials over great ideas and the determination to see them through. And along with Andraka, we would like to highlight the Intel International Science and Engineering Fair (ISEF), which helped shine a national spotlight on Andraka's work. The ISEF provides a forum for more then 1,600 high school students from over 70 countries, regions, and territories to showcase their work while competing for more than $4 million. In 2012, Andraka was the recipient of the 2012 Gordon E. Moore Award. Not only is it the grand prize, but it also helps prove that there has never been a greater potential for teenagers today.